We have chosen as the prototypes for our French harpsichord kit two instruments made in Paris in 1769 and 1770 by Pascal Taskin, possibly the most famous of all 18th century French makers. We made this choice because the mid-18th century French style harpsichord represents the most successful "general" purpose instrument. 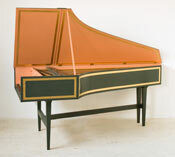 The instrument is suitable to all of the harpsichord literature of the baroque. The completed kit rewards the builder with a double-manual instrument of elegant proportion and detail having a range of five octaves, FF-f''' (61 notes). There are three ranks of jacks and three choirs of strings, 2 x 8', 1 x 4', with a buff stop which can be installed on either the back 8' choir or the upper-manual 8'. An additional peau de buffle register with leather plectra can be added to the lower-manual 8' if the builder chooses. The transposing keyboards are replicas of Taskin's keyboards. The steel wire normally supplied with our kits is of a lower tensile strength than modern music wire. Its tensile strength reproduces that of the wire used in the 18th century and its high flexibility produces a tone somewhat richer in the lower harmonics and clearer in overall impression than harder wire. French kits include a trestle stand. 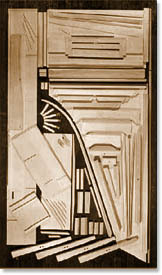 However, continental harpsichords in the mid 18th century were often supported by a set of turned and fluted legs attached to a low rim or apron. 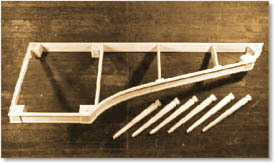 Later the legs were often attached directly to the bottom of the instrument. We offer the builder the option of purchasing in place of the trestle stand either a set of Louis XVI style legs, which can be screwed to the bottom of the harpsichord, or a Louis XVI apron, fully assembled with decorative moldings and screw-on legs. Other options are listed in our catalogue and price list. We now have a demonstration CD of this instrument available ($10.00 ppd. in U.S.). Please - inquire via our contact form. For those builders whose musical requirements are considerable but whose resources are limited, our Flemish single-manual kit with its bold sound and unusually large range is ideal. 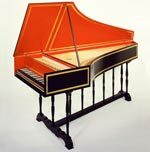 Designed as a small concert harpsichord with transposing keyboard and a compass capable of performing virtually the entire baroque literature, the resulting instrument amply rewards the player with substantial artistic demands. Compact and light, this harpsichord is practical for the professional on tour and for amateur ensembles that require frequent moves. For home or institution, professional or student, we offer no better value. The kit is patterned on an instrument built in Antwerp in 1584 by Hans Moermans. We have followed the 18th century practice of ravalement and extended the range of the original from 55 to 58 notes (GG-e''' chromatic). We have also added a French 18th century scaling. It is disposed with two eight foot (8') stops and a buff stop. Like the French harpsichord kit, the Flemish Single-Manual Kit is available with a number of options, among them block printed papers (replicas of traditional Flemish designs) to decorate the interior of the instrument. This kit will make a careful reproduction of an instrument which carries the inscription: Moermans Antwerpia 1584. Frank Hubbard was able to purchase the original from a private collection in Belgium in the 1960’s. It is one of the few surviving instruments to carry the Moermans name. Whatever uncertainty there may be concerning the attribution is beside the point – the instrument is very good, indeed, and a fine example of a large Flemish single. We have made this design as a finished instrument many times and have been constantly delighted by the quantity and quality of sound. The keyboard has an apparent range of four and one-half octaves extending from BB (two octaves and one semitone below middle c') up to f''' (two octaves and a fourth above). It was expected of earlier harpsichords to achieve an expanded lower range by re-tuning some of the notes in the bottom fourth. The low BB key is to be tuned to the pitch GG, likewise the C# is then tuned to AA and the D# to BB. In this way a range of 4 7/8 octaves is achieved at the expense of three little-used chromatic notes in the bass. The construction and balancing of the keyboard in this kit are identical to the original. In a departure from this design’s past offering, this instrument is intended for the experienced builder. We have computed and made available a credit for the omission of the parts and hardware for the stand, lid parts (all solid wood) and music desk. Further, this is the ideal sort of instrument to fit out with wood jacks and so they are standard and, yes, some assembly is required. For those who have been taught to fear wood jacks (and learned too well), a credit is available for the substitution of Hubbard Delrin jacks as well.